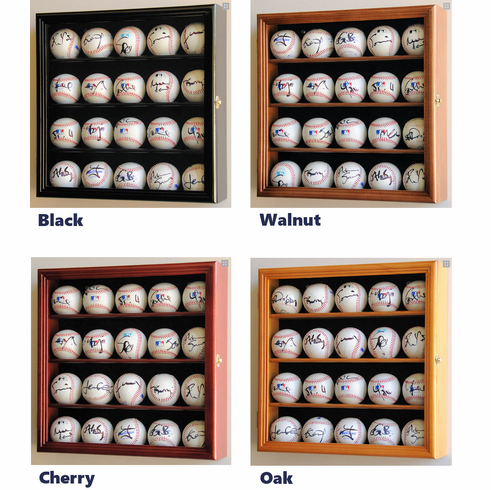 Solid furniture grade beech hardwood baseball display case of beautiful design and construction is the perfect solution to show off 20 of your prized baseballs or hockey pucks. Cabinet comes in oak, cherry, walnut or black finish and features a framed acrylic door (98% UV resistant with two keys) to keep out dust. Black felt background gives added contrast. Matching wood shelves come with indentations to securely hold the balls in place. Display case is completed with brass hinges, door latch, and installed heavy duty wall hanging hardware (balls are not included). Unit Weight: appx. 8 lbs. Outside: appx. 16"H x 16"W x 4.00"D.